Following Apple's revelation it anticipates missing its revenue guidance for the December quarter by $5 billion, as well as Samsung's lackluster revenues caused in part through a softer Chinese smartphone market, it isn't too much of a surprise that anyone will warn of a global smartphone market contraction. The analysts at Credit Suisse seem to think the decline is actually quite significant. In a note to investors received seen by AppleInsider, smartphone production levels are in free-fall, with the "bottom not yet in sight," indicating manufacturing will continue to go down for a while longer. Credit Suisse recently revised its production forecast for the last three months of 2018, putting global production at 357 million units, a year-on-year fall of 3 percent for the period. While the drop is discouraging, it pales in significance to the predicted first quarter output of 289 million units globally. In effect, this represents a year-on-year drop in smartphone production of 19 percent, leading to around the same amount of production as seen in 2013 when overall production levels were rising. "It is too early to [say] whether this news is already fully discounted in share prices, or will continue to have an impact," notes Credit Suisse. 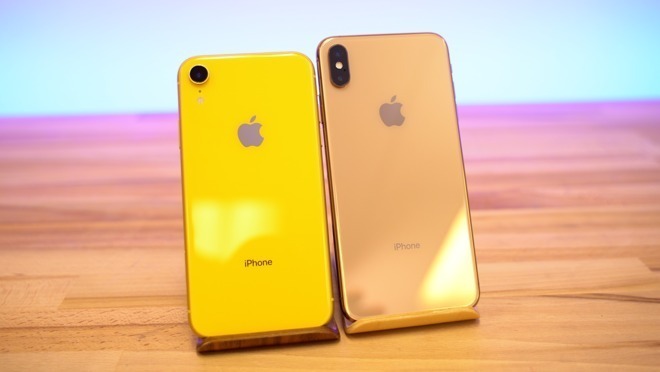 Up until January's revenue warning, Apple has been relatively resilient to the global smartphone market contractions that have been reported over the last year, with one November report noting that while there was a lack of growth in iPhone shipments over the Q3 2018 quarter, this also meant it wasn't seeing a reduction in sales for the period either, while other manufacturers like Samsung bore the brunt of the shortfall. Analysts, and Apple itself, all seem to suggest China is a major contributor to slower than expected sales in recent months. Apple CEO Tim Cook advised of "lower than anticipated iPhone revenue, primarily in Greater China" accounting for the revenue shortfall. The lower sales are also not necessarily restricted to China, as other markets may be saturated as well. One October report from Pew indicates 95 percent of U.S. Adults in 2018 own and use cellphones and 77 percent own and use smartphones, suggesting there is relatively little room to increase sales to new customers in the United States without having to fight competitors.